Today is a very special post! It’s a sharing of my latest secret shoot in Paris! Coming up is wedding season, and I have a wedding to attend almost every month! Stopping by the city of romance, of course I had to take a dip at it! (And nope, I will NOT be a bride ANYTIME SOON! This is just for creative purposes!) So presenting to you all today, my bits of romance in Paris. And my little behind the scene story of shooting for it! Enjoy! This look book is shot at Grand Pigalle Paris. A cute little boutique hotel in the heart of Pigalle. The balconies overlooking the city is a traditional romantic Parisienne vibe. I just adore it to pieces! 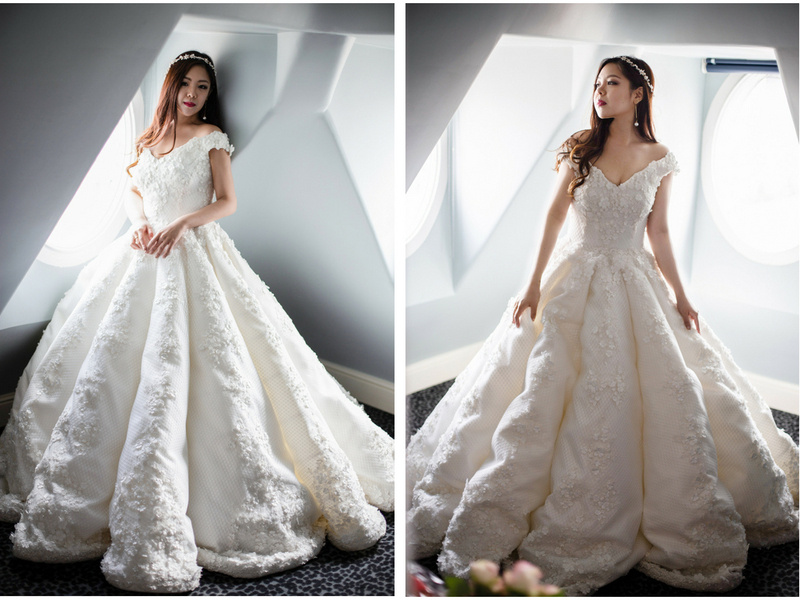 This may be a wedding dress, but in reality, I just wanted to write a romantic fairy tale. My ideal of romance can not go without fresh flowers. These beautiful French roses are a favorite of mine. I just love how soft the combination of pink and fresh greens and whites are! Story about how I got these flowers? Well, I had to hunt down three local flower shops before finding the perfect ones. After all, making visualizations a reality is key! I’m a girl that goes for my heart’s desires! 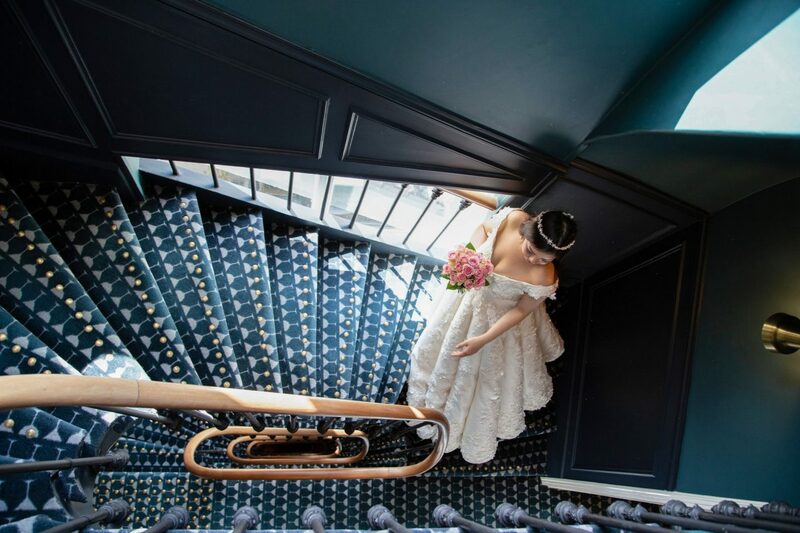 Many shoot their wedding photos in the grandeur architecture of Paris. However, for this look book, I wanted to focus on the little fun interior details. Something a little different than your norms. I think the contrasting feel is spectacular and oh so fun. What do you think? Does this princess look like she’s rightfully seated on her throne? I hope so. Here, I’m playing more with the veil (or the little cloak as I like to style it). This was not the actual look I visualized. But I still think these turned out quite alright. Picture on the right makes it seem like I’m longingly waiting for something or someone. Prince Charming? Nah. This princess takes action and waits for nobody! Probably just day dreaming about where to escape to next. I personally love how free and expressive this shot is. Honestly, letting loose without a care in the world. I remember the weather that day to be perfect as well. Not too hot nor too cold. Just perfect and crisp. Personally, the contrast in textures and colors here have my heart. It’s a little different from the rest of the shots. I love the fun colors in this suite. By the way, little story about those earrings? I totally forgot to bring glitzy earrings for the shoot, but somehow did not forget the fresh flowers and little blinged-up flower crown. I was in luck that this pair actually matched the pearl embellishments on this dress and in turn made a nice accented statement. All the hardware in the accessories I’m wearing in this shoot ended up being gold toned. Which I think ended up quite well. Classic illusion spiral stair case shot. I think this shot captured the vibes of the hotel. Again, with the fun retro, but romanticesque deep turquoise blue and warm toned embellishments. Love. And of course we can’t leave without a full glimpse of this beautiful dress. Cheers to this poofy princess cut dress that transformed me into a princess. 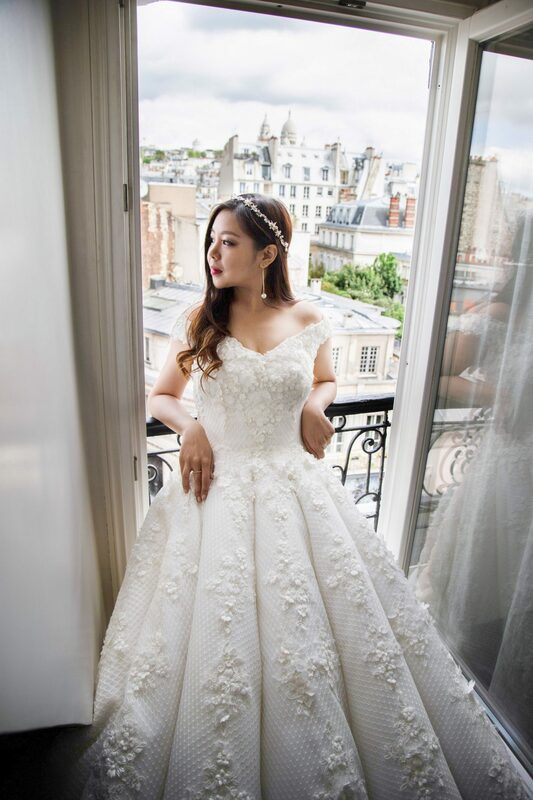 Gave my first time wearing a wedding dress to my first trip in Paris – with no regrets! I actually love how structured it is! Reminds me of a flower. And all the embellishments are just so luxe! Anyway, I hope this look book gave you bits and hints of romanticism for the princess and/or prince in you. And IF you’re a bride-to-be or groom-to-be you’ll have some inspiration for wedding gowns, wedding shoots, or destination travels from this! I’m always here to inspire and spread love! PS: This shoot actually took much longer than anticipated, so I’d like to personally give my photographer, Scander a big THANK YOU for his time and putting up with me! We shot from a little before 9am until about 3pm. That’s like 6 hours! Of course, it wasn’t just this look, but I think this look took a huge chunk of time. Really, photographers are so important and deserve the utmost respect! So I can not say enough thank yous! If you’re enjoying these photos and are looking for a wedding photographer or portraits photographer in Paris, you can book this’s lookbook’s photographer, Scander through THIS website. PPS: I hope you enjoyed our work! And feel free to write back to me with anything you want to ask or just a comment you want to share! Other than that, have an excellent weekend! Previous Post Copenhagen Ready! Shop. Dine. Coffee. Next Post Paris Trip Designer Shopping Haul + How to Calculate VAT Refund! The photos are amazing. My favorite is the one with you outside the window looking at the sky. The dress is also beautiful. oohhhh how stunning is that dress! Your photos turned out amazing too 😊. 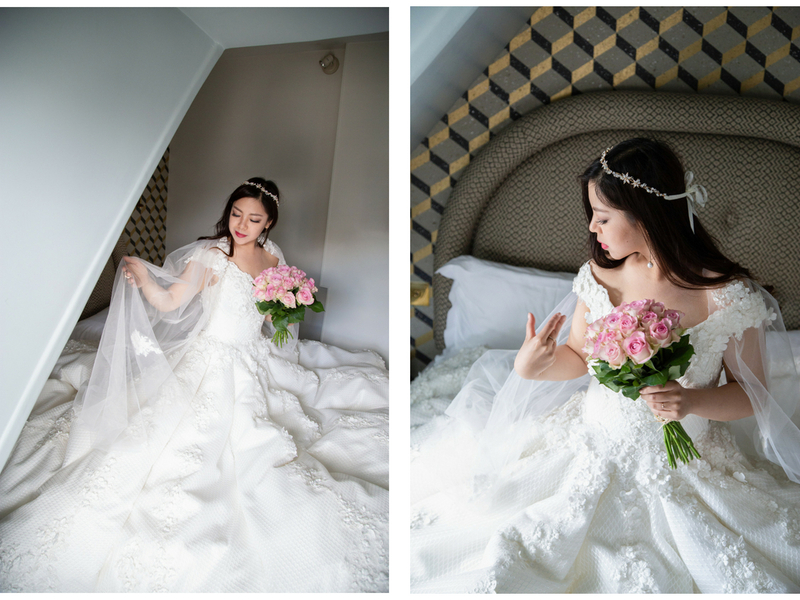 I’ve always thought that bridal photos/shoots don’t make much sense but they sure look like a fun time – especially for the ladies cause we get to play dress-up! oohhh how stunning is that dress! And you look amazing too 😊. I’ve always thought that bridal shoots/photos seem a little silly but they sure seem like such a fun time. Especially for us ladies cause we get to play dress-up! Wow, these photos are spectacular. You look amazing in this dress. And I so agree, photographers are fabulous. Paris is such a magical city. Wow what some amazing photos! You look absolutely gorgeous and what a thing to remember from your time in Paris. What an absolutely stunning dress! I particularly loved the carefree shot out of the window, as well as the shot on the spiral staircase. Very dramatic with a romantic flair. Love it! Looking fabulous in the photos. I love the details on the dress. So unique. Wow, you look gorgeous in that dress, girl! Every shot looks fantastic! Oh wow, you look stunning dear! That dress is so perfect on you. Such a dainty look! So many beautiful shots in this post. Love the one off the balcony. I agree it’s quite liberating. We can all appreciate a little fairytale in our lives. The royal wedding this May brought all back to believing in fairytales. The scene is beautiful and you are stunning in the dress. Omg your wedding gown looks so whimsical. Looks straight out of a fairytale congrats! 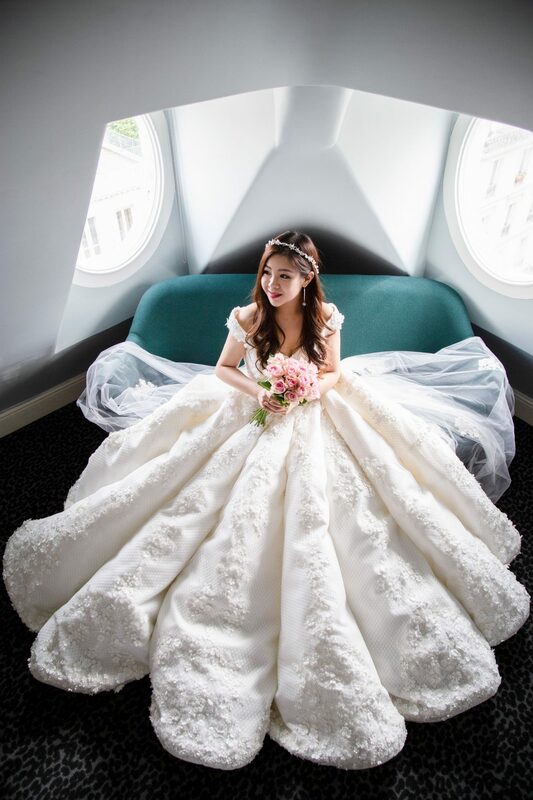 its an amazing wedding gown..i should say…! Beautiful photos! 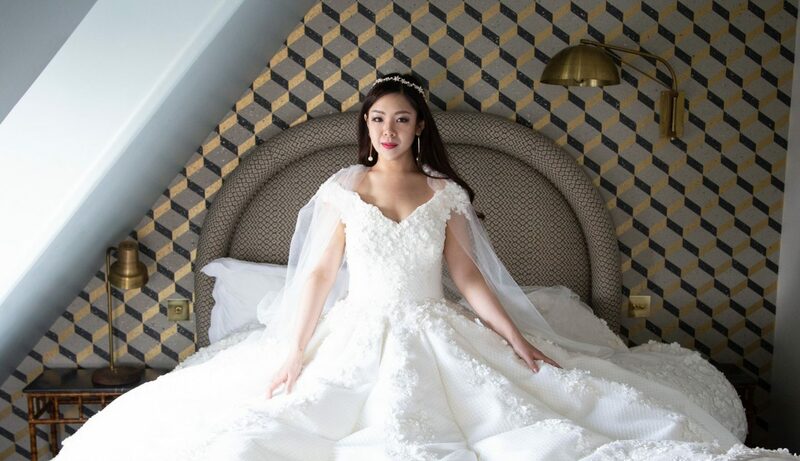 I could never have pulled off a ballgown wedding dress like that! I am in awe with your dress. it is so beautiful and you are so lucky to wear it. The photographs are wonderful. You really nailed the dreamy look with this shoot. You look incredible! Ok I think I’m officially obsessed with this wedding dress! What a cute photo shoot idea! You look so relaxed! That is a really beautiful dress. I like that its not too much going on but has enough of sparkle.